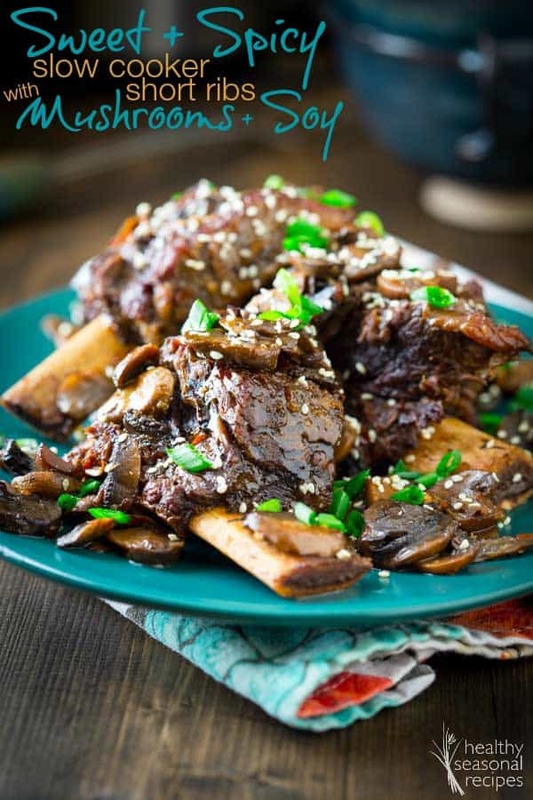 Healthy Sweet and Spicy Slow Cooker Short Ribs! They are so flavorful with a mushroom, ginger and soy gravy that is rich and delicious! 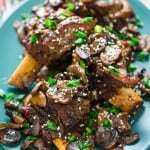 Yesterday morning at 8 am, I stood up from my desk, hypothesis draft of this recipe hot off the printer (trying to not sound like a six-year-old facing down the green faced long fingernailed witch in her closet) and said, “I’m not afraid of you!” But truth be told, I was afraid of these slow cooker short ribs. 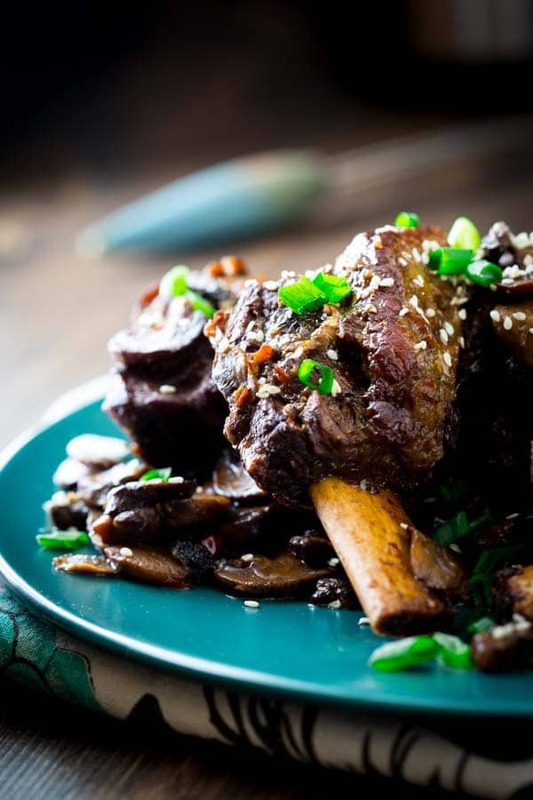 And chances are that the three brave of you who are left reading this while the rest of the people have run away screaming at the mere name of this recipe are still a little intimidated by the idea of cooking short ribs. Truth also be told, I wouldn’t have even attempted to try cooking them at all if we hadn’t gotten a package of them in our mixed box of frozen grass fed beef a few months ago. And there they have been waiting for me in all their intimidating bone-in glory. Not today guys, I’ve been saying as I reach for the stew meat or ground beef. But something had moved me to thaw them this time. Maybe it was that I was so relaxed after my trip to Mexico. Or maybe I was just having the first of many senior moments to come (now that I am 39 ½), and I thought it was actually a package of bacon. I don’t know. Whatever it was, there the short ribs were, thawed and waiting for me as I looked into the depths of my slow cooker. And I was in fact afraid. If I had an Instant Pot, I would have made them like these Instant Pot (Pressure Cooker) Beef Short Ribs Recipe. But I don’t have a pressure cooker yet, so the slow cooker it was. So, I went for it anyway. And now, having spent only 15 minutes getting the ribs cut and seared and smothered in spicy sweet sautéed mushroom sauce and then in turn enjoying the hella yummy aroma that emanated from the slow cooker for the rest of the day, I am here to tell you three FEAR NOT, my people, fear not. Because then comes the eating part. In case the ease of preparation part doesn’t entice you, let me sell you on them by telling you how succulent these babies are. I get it. If the idea of figuring out an unusual cut of mystery meat scares you too, maybe it will alleviate your worries a bit if I tell you this: the meat gets so tender that it slips right off the bone, so even if you some how don’t cut it up “right” or you are not sure what you are looking at… that’s totally okay. It will be so galdarnedsoftandtender when it is ready you won’t care. And then there is the sauce. In the spirit of making this scary-sounding cut of meat a breeze to prep, I’ve kept the steps for this recipe super simple. You’ll first need to pat the ribs dry (very important!) and sprinkle them with salt. Then, sear them in a well oiled pan until they’re browned on all sides. Transfer the ribs to your slow cooker, and add a little more oil to the pan. Sauté the mushrooms just until they begin to release their juices and then stir in the gravy ingredients. Add all the mushroom goodness to the slow cooker, and then pop on the lid and let those short ribs cook on low for 6 hours. Be warned: your kitchen will smell amazing after those 6 hours. 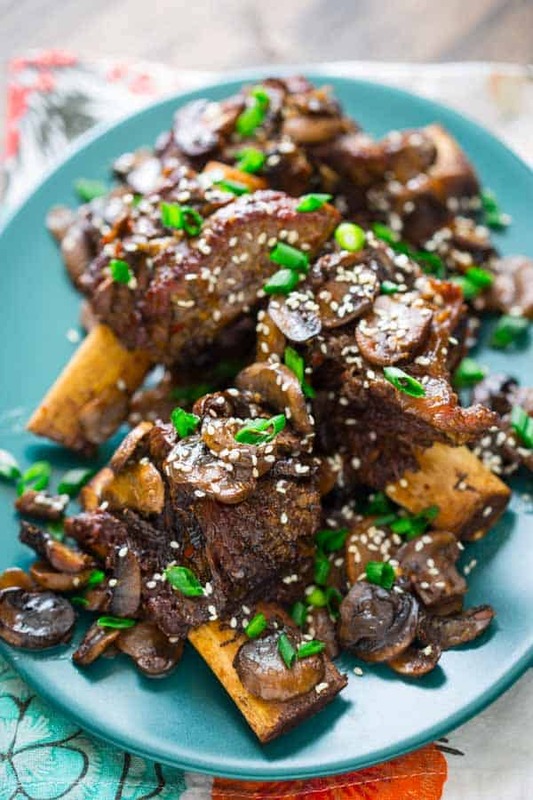 You will want to open the lid of the slow cooker to gaze longingly at these slow cooker short ribs, but you must resist! (Okay, I’m kind of joking. But they are really good). More short rib info than you’ll know what to do with on the Kitchn. Need some liquid courage? Try a Mumbai Mule from the Bojon Gourmet. This Power Salad with Peanut Dijon Dressing from Meg is sooo happening in this kitchen asap. If you are in the mood for a laugh out loud tear jerker read this awesome post by Carrie about her foul mouth baking Bambi and then drool a bit over her Maple Cinnamon Rolls. Don’t be intimidated by the name, these slow cooker short ribs take only 15 minutes to get into the crockpot. Then they become meltingly tender and so spicy and sweet! I love the flavor and the umami sauce with mushroom and soy. Pat ribs dry and sprinkle with salt. Heat 1 tablespoon oil in a large skillet over high heat. Add ribs, and sear until browned, 2 to 4 minutes. Turn over and continue cooking until browned on the bottom, 3 to 4 minutes more. Transfer the ribs, bone-side down, to the insert of a large slow cooker. Add the remaining 1 teaspoon oil to the skillet and reduce heat to medium. Add mushrooms and cook, stirring often until starting to release their juices. Remove from heat and stir in coconut sugar, Bragg’s Aminos or soy sauce, ginger, sesame oil and red chili flake. Pour the mushrooms over the ribs (do not stir.) Cover and set timer on low for 6 hours. Gently remove ribs to four plates with tongs. Spoon fat off sauce. Serve ribs with sauce on top and scallions and sesame seeds added for garnish. Katie, these look amazing! My goodness, you made my mouth water at 5:30 a.m. Now, how is that going to look if I want these for breakfast? 🙂 Pinned! Kristi, I won’t tell anyone if you have a short rib for breakfast! Ha ha. Thank you so much for pinning! So glad you worked through your fear of short ribs! Amazing how low maintenance they are to cook, right? 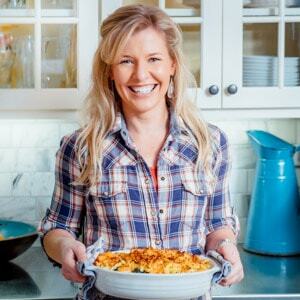 Awesome recipe and mouthwatering photos, Katie!! Me too. They are so low-maintenance. That is a great way to describe it. This look so good and I’ve bookmarked it to make later. I haven’t had good luck with my slow cooker, but I’m determined to like it. All I need is one good recipe to make me change my mind, because right now I’ve not made one thing in it that I want to make again. Annette so glad to hear you are going to try it. I have found that I like recipes that brown meat on the stovetop first best. 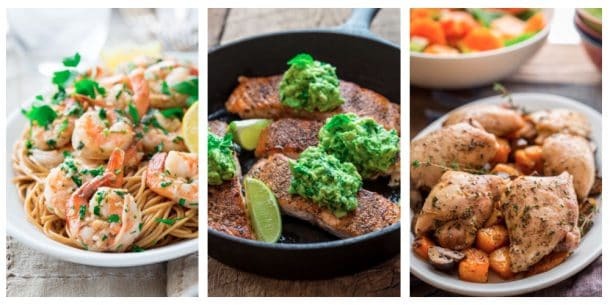 WOW ~ these look amazing I can’t wait to try! Thank you so much Elizabeth. Have a great day. Whoa, those ribs look insane!! Thanks so much for the shout out, Katie! I am so glad to hear it Maggie. I really appreciate your coming back by to report! Awesome ribs! I like it and I will do it because I love slow cooker recipes. I presume boneless short ribs would work just as well with little or no adjustment? So, no liquid in the crock pot besides the 2 Tbsp of soy sauce? Thanks in advance. The mushrooms exude a ton of liquid when they cook. They start to do so in step #2. Just cook them until they start to give off the liquid and then they will continue to do so in the crockpot. Thanks for asking Miles. Hope you enjoy.